Having spent a good deal of Saturday evening in a vegan restaurant, with bookshelves stacked with all manner of literature plus a few useful Kyoto guides I wrote down a several places to go and visit. I'm still not sure if the food was one of the many traditional Japanese vegan cuisines, where mucking around with the food is frowned upon, or whether it was simply a hippy, student hang-out where vegan was the in thing. It certainly had the feel of the latter but the range of classic Japanese food stretches a lot further than sushi and tempura. So, on Sunday, with notes from the previous evening in hand, I headed to Nishiki market, said to be the kitchen of Kyoto. 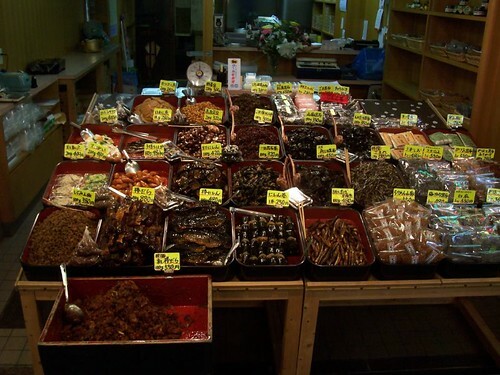 It's a covered market with roughly 400 shops selling every possible ingredient and piece of kitchenalia that one could want for authentic kyo-ryori (kyoto food). 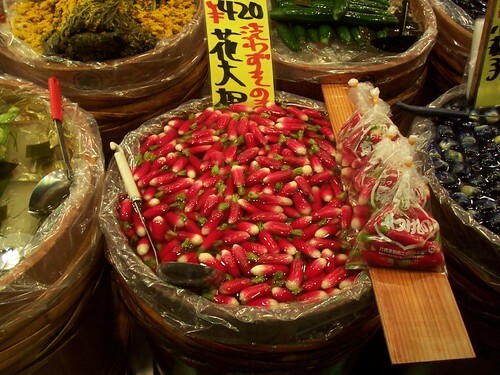 Vegetables in pickling vats (Tsukemono), vast arrays of sweets, all manner of fish including dried bonito being sliced into strips so thin that they fill the air around the shops, make for an amazing range of sights, sounds and smells. 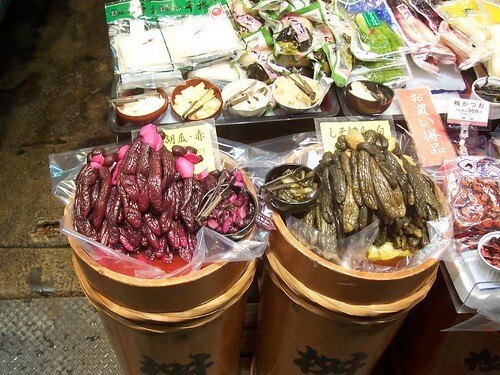 Many of the shops have sample dishes and though you wouldn't want to fill yourself up purely on pickles and sweets you can certainly try a good selection as you walk around. I was drawn to a knife shop where they were sharpening the stunning blades on whetstones at the counter. The knives are very very expensive but quite simply some of the best in the world. In Beijing I'm just not cooking these days but when I'm back to full speed in the kitchen I'd love to buy a traditional Japanese knife. My Global is my pride and joy in the kitchen but a hand made one directly from Japan may surpass even that. Having whetted my appetite on the samples, I walked into one of the restaurants which sit above the shops and line the market street. Pointing at a picture was the only means of communication and when the meal arrived I was rather bemused as to the next step. Amongst other side-dishes the meal consisted of an empty bowl, a pot of rice, a small plate of grilled eel, a plate of pickles and wasabi and a pot of tea. It was clear that I didn't know how to proceed so the waitress came over to help and mimed that I had to put all the ingredients in the bowl (to my personal taste in pickles) and then pour the tea over them. Making a pickly, fishy, tea broth doesn't sound great but the subtlety of the flavours means that it's actually a very fine meal. Anyway, I'm going to leave it there, I didn't get much sleep last night having had an exciting idea yesterday. Today I'm frantically working out the possibilities and consequences.